The day I met one of my heroes. Lesléa and I in 2014. One of my favorite authors has a new book out about one of my favorite topics. 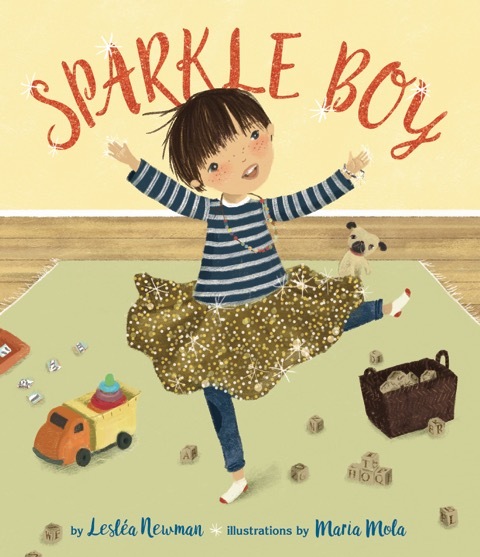 Lesléa Newman’s Sparkle Boy is about a little boy who loves things that sparkle, shimmer and glitter. He’s a lot like my son C.J. 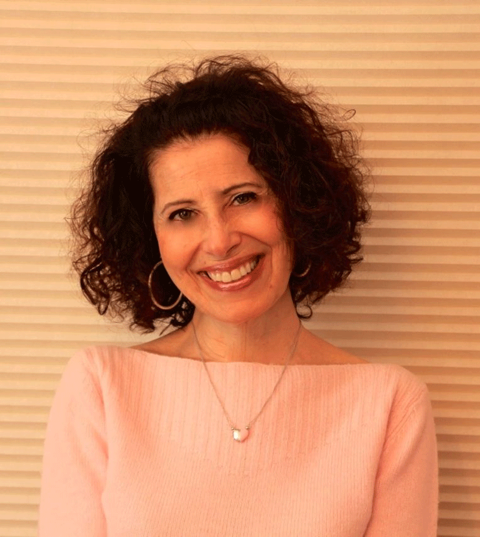 I interviewed Lesléa about her new book and her work over the last 35 years as an award-winning, trailblazing author and advocate for the LGBTQ community. 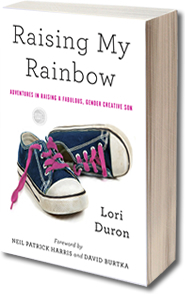 Lori Duron: I discovered your work when my brother gave my sons your book The Boy Who Cried Fabulous. As a fabulous, gay uncle, he wanted his nephews to see characters like him in literature. Little did we know that the book would resonate so much with my youngest son, C.J., who is fabulous and gender creative. After I started my blog, I reached out to you to say how much that book meant to us and our son. And I wrote a blog post about it. 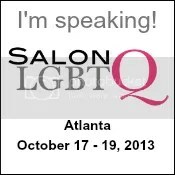 Lesléa Newman: I so appreciated hearing from you! The Boy Who Cried Fabulous resonates with lots of people, including teachers and librarians who love the fact that it contains so many adjectives, which is something I never thought of. Duron: Shortly thereafter we discovered A Fire Engine for Ruthie, about a little girl who likes motorcycles and fire engines. I feel like that book doesn’t get enough attention. I mean, it came out 13 years ago and the protagonist is clearly more than a tomboy — she’s gender creative. Once again you were ahead of your time. What was the reaction to that book when it was first published? Newman: As far as A Fire Engine for Ruthie goes, I wrote that book as a direct response to Charlotte Zolotow’s classic, William’s Doll. The book did well when it first came out, but unfortunately it never went into paperback and is now out of print. (Any takers out there?) Tomboys of all ages really liked that book. Duron: And, now, all these years later, you give us Sparkle Boy (out June 15). Thank you for writing this book, it’s so important that gender creative boys like my son see themselves in literature. What inspired you to write Sparkle Boy? Newman: I was inspired in part by your book, Raising My Rainbow, which I was moved to tears by many, many times. I also learned a lot, especially about the different journeys each family member takes, in addition to the journey taken by the person in the family who is gender creative. Jessie, the older sister of Casey, who is the “sparkle boy” in my book, starts off in one place emotionally at the start of the story, and ends somewhere else. I think this is very important, and shows that everyone goes through a process when someone in the family discovers something about themselves. I was also inspired by attending Family Week (in Provincetown, MA) which is run by the Family Equality Council. I saw so many little boys wearing tutus happily running around, filled with joy at being able to be themselves. One boy’s dad said to me, “I wish my son could wear his tutu every day, not just in Provincetown during Family Week.” And I remembered what you said in your book—that your job as a parent is to make the world a safe place for your son to be himself. That is my intent with Sparkle Boy: to put forth a book that respects, accepts and celebrates everyone’s right to shine! Duron: You started writing books that deal with LGBTQ issues and identities in the 1980s, long before there were LGBTQ shelves in popular bookstores and online booksellers. What was it like writing about LGBTQ issues and advocating through written word back then? Newman: You know, I really didn’t think about it. When I came out, in 1982, my writing just exploded. Previous to that time, I only wrote poetry and considered myself exclusively a poet (I had studied with Allen Ginsberg and Anne Waldman at the Jack Kerouac School of Disembodied Poetics at Naropa Institute in Boulder, Colorado). But in the early 80s, much to my surprise, I wrote a novel called Good Enough to Eat, I was hungry (pun intended!) for books that featured a character like me (a Jewish lesbian) and couldn’t find any, so that’s why I wrote it. I write to explore the world inside me, the world outside of me and the relationship between the two. I followed up that novel with a short story collection called A Letter to Harvey Milk. Each of the nine stories featured a different Jewish lesbian. And I was still writing poetry. I didn’t write these books to make any kind of political statement, though I do think writing as an out lesbian about lesbian characters is a political act. I was just writing stories about my life and the lives of the people in my community. I took the advice of Grace Paley, with whom I also studied, who said, “Write what you know you don’t know about what you know.” And then a lesbian who knew I was a writer stopped me on the street and said, “There are no books that show a family like mine. Someone should write one.” And, thus, Heather Has Two Mommies was born. Duron: Heather Has Two Mommies was a pioneering book. It was the first children’s book to portray a family of two lesbian moms and their child in a positive way. What was the reaction to the book when it was first published? Newman: I had a lot of trouble getting the book published. No publisher would touch it. Finally, my good friend Tzivia Gover and I decided to put the book out ourselves under the auspices of In Other Words, which was her desk top publishing business at the time. We sent out fundraising letters (before the internet! licking envelopes and stamps!) and raised about $4,000 — mostly in $10 donations. Then we found an illustrator through the lesbian gravevine and printed 4,000 copies. I never thought anyone except lesbian moms would be interested in the book, so I was surprised at the huge reaction it received. Duron: You’ve written more than 70 books and your works are pretty evenly divided in terms of intended audience. About half are for an adult audience and half are for children. What are the pros and cons of writing for each audience? Newman: To me, it’s really all writing. What I try to do is let the content dictate the audience (children, middle-graders, teens, adults) and the form (poetry, prose, fiction, non-fiction). As long as I’m writing, I’m happy. The advantage to writing a picture book, is that usually—though not always—it takes less time to write than a chapter book or novel. The advantage to writing a novel is that I always know what I am going to be working on when I return to my writing notebook the next day (as opposed to starting from scratch every time I finish something short such as a poem or a picture book). What I love about writing for children is that a book such as Heather Has Two Mommies can really make a difference in a child’s life. So many families have told me how important that book was to them because it was the first time their children saw a family just like their own between the covers of a book. That is extremely important and validating to a child. What I love about writing for adults is that often I hear from readers who tell me how my work has touched their lives. I never get tired of hearing that. That’s what it’s all about. Duron: I think it’s important for people to know that you’re an amazing voice for the LGBTQ community through written word and the speaking that you do, but you’re also such an encouraging and nurturing mentor. You help emerging authors and advocates; that’s something not a lot of established authors do. They don’t always want to help other people. Newman: I don’t really understand that. I firmly believe that when one of us succeeds, all of us succeeds. So many people have been kind to me along the way: my mentors, Allen Ginsberg and Grace Paley; the women in my writers group; and so many others, too numerous to mention. The literary life is not an easy one. Authors need to stick by each other and support each other. I am always thrilled when emerging writers I have mentored succeed (shout out to Newbery medalist Kwame Alexander author of The Crossover, and Leah Henderson whose first middle grade novel, One Shadow on the Wall has just been published). Allen and Grace kept in touch with me for years (again, before the internet), always showing an interest in my work and taking me seriously as a writer. That was so important to me. I honor my mentors by paying it forward. 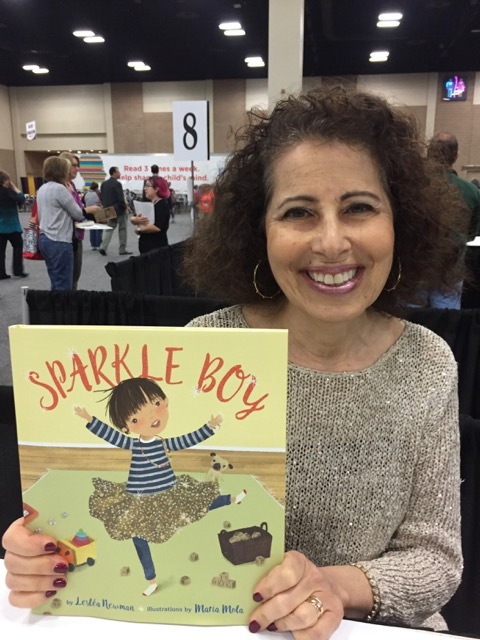 This entry was posted in All Posts and tagged books, Gender, gender creative, gender nonconforming, Gender Stereotypes, Leslea Newman, LGBTQ, Sparkle Boy. Bookmark the permalink. I had no idea she’s written so many books! I feel like a bad lesbian… will be looking up all her titles now. It’s extremely important that there are such authors out there encouraging children who do not feel confident with themselves. And such stories, like the one about the senator who made this book as an example of encouraging children to live different from what is “normal” according to him and his folks, so disgusting. Just bought the book. 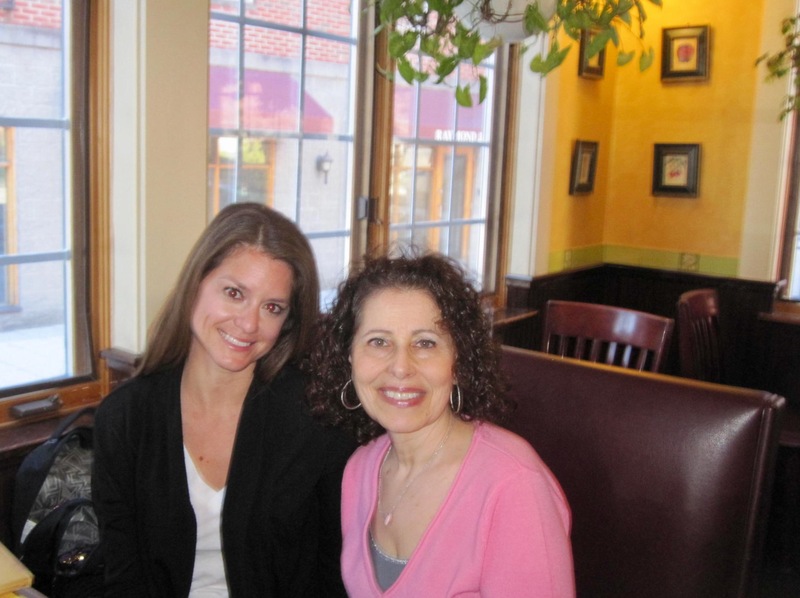 I am so thankful for having you and authors like Leslea in my life. My 9 year old gender creative son told me that the girls in his class give him their glitter because he likes it so much. He comes home with glitter all over his face. He will love this book!